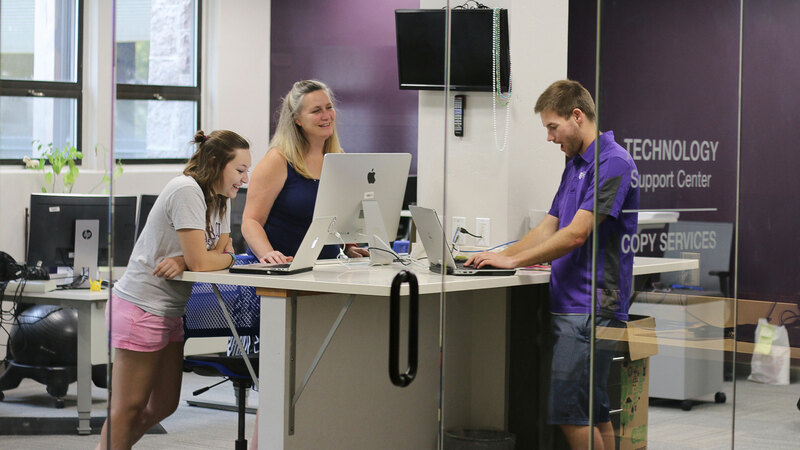 Campus Computing and Information Technology (CCIT) provides technology services and support for students, faculty, and staff through the Technology Support Center, located in the St Charles Lobby area. Services include assistance with connections to the campus network, and general computer system troubleshooting. CCIT also has an office for Network Services and Colleague Administration in 113 O'Connell Hall, while Instructional Technology staff, providing directed assistance for technology in the support of Teaching and Learning, are located at the CITE in the Corette Library. We've got answers! Check out the following pages for more information on these topics! Get Connected Find out how to connect your device to Wifi. Help Great place to start with basic account info & where to get help. MyCarroll. This is a web-based tool for registering for classes and paying your bills from any computer with Internet access. Policies Be sure to read the Acceptable Use Policy before you use any computer or network resource on campus. You will be held accountable for all your actions while using these resources. VMWare Horizon - Connect to campus tech services and computer labs through our virtual desktop client. A computer network account is created for each student when they are registered for the first time. When the account is created, it is setup with a temporary password. As a new student, you will receive your account username and temporary password in either an email or letter once you have been registered. This password must be changed before actually accessing any campus resources. Referring to the personalized account information you received, you will use the Thycotic Password Reset to change your temporary password. Use the Activate Your Account button to change your temporary password and activate your account. Note: Once you have chosen your new password, you can find the links to your Student Email, Moodle and Carroll Apps ( includes MyCarroll, Google Apps, Office 365 and Regroup Emergency Messaging) by scrolling to the bottom of any page on the website. If you do not receive your account username and temporary password prior to the first day of class, please visit the IT Support Center in St. Charles Hall for assistance. In an effort to go green and reduce printing to incorrect printers, as well as providing you with the details of your print job (name of document, size, number of pages, color or b/w, and cost) we have implemented a Print Release web interface. Choose Print from the program you are using, and then go to the following website, login with your Carroll username and password, select the job you wish to print and then click Resume. For more details on using the campus network printers, check out the Print Services page. Submit a question or problem online at our virtual help desk, and we'll get back to you as soon as we can! Or for help connecting devices to the Carroll wireless network? Check out the Network Services page - up to date information on connecting all of your devices. Our business hours are 8:00 am -- 4:30 pm. Call 406-447-HELP (4357 ) or stop by our HELP Desk in the Technology Support Center within the St. Charles Hall Lobby. For after hours support Tech Saints are available in the Makerspace (St. Charles 12) Sunday-Thursday 7-9pm.